American Express does, indeed, work in mysterious ways. The company has decided to launch a pop-up ‘Centurion Lounge’ in London for six days in the run up to Christmas. Free alcohol is the main attraction, to be honest, as you will see below. American Express is taking over private members’ club, The Hospital Club, near Covent Garden. The lounge will be open from Friday 24th November to Sunday 26th November and from Friday 1st December to Sunday 3rd December, from 11am to 8pm. You will apparently get access with a Platinum or Centurion card. Each cardholder can bring two guests, so presumably if your partner has a supplementary Platinum card then you’d be allowed four guests between you. Personally, I’ll be sticking to the free drinks “from Centurion Lounge renowned mixologist Jim Meehan”. There is apparently free food and drink all day with a special ‘cocktail and canapes’ happy hour between 5pm and 7pm. I reckon that Head for Points has at least 1,000 London-based American Express Platinum cardholders amongst its readership. I suggest we head down there for cocktails and canapes at 5pm on Friday 24th November. If you don’t have a Platinum card, come along anyway if you’re nearby – I’m sure someone can guest you in ….. I can make 24th if someone can guest me in? Harminder, I will be wearing black beret, rain coat and fake mustache. See you there! Can genghis (or other) please remind us how to add oneself as supp? just add a sup in your name and put ‘other’ as type. I did it last week and it has now arrived. Rob, I am in the UK and I got an email from Amex with the details of the lounge yesterday. It was right at the end of the email. I am not sure why I read all the way to the end, I don’t normally, but for once I did and there it was! The Centurion Lounge, designed exclusively for American Express® Cardmembers, is coming to London for two weekends this Holiday season. 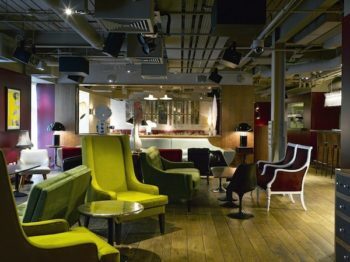 Platinum Charge Cardmembers are invited to escape from the hustle and bustle of London’s Convent Garden, and unwind in the surroundings of our pop-up Centurion Lounge at one of London’s top private members’ club, The Hospital Club. Once inside, relax and enjoy the finest food, drink and festive entertainment, while the little ones learn how to make snow globes or play in our festive family area. The magic doesn’t end there, with our beauty treatments and grooming stations to get you Christmas party ready. Plus, visit our perfume experts who will help you create your own home fragrance. I don’t know if it’s just me but I hate the word “influencer”. Hope I can find it in the “hustle and bustle of London’s CoNvent Garden”! I can make either 24th or 1st, if someone doesn’t mind guesting me in. I’ll queue for the drinks at the inevitably ramped bar in return! I’m also happy to make 1st if someone does not mind guesting me in and happily queue for the drinks! Dont forget to remind amex to order more booze on the 24th as they will have 1000 extra visitors at (or 3000 if each brings two guests!). Can’t make either dates. Tempted to try it out another day when I’m in London. Will certainly be cheaper than my bar bill at the Savoy the other week, although the bar was great with the pianist. Lounge related – BCN in T2 is terrible for food and WiFi. Drink selection was good and pour yourself. When I went it was rather busy but suspect due to the conference in the city this week. Think I’ll take a friend down there for late lunch drinks on the 24th. Happy to guest someone in on 1st Dec. though. Just pm me on FT. Always wondered about the choice of name ‘VISTA’ by Amex, given that it is only one letter (or sleepy skim read) away from VISA. What is the Vista newsletter? The Amex Platinum special events newsletter, which my spam filter eats. Apparently, that newsletter is exclusive to Amex Platinum Business cardholders. Other platinum cards do not get that newsletter. No, Vista is the personal one. They are confusing Vista with something else.